Veterans Center on Monday. Master of Ceremonies, Dave Tanguay welcomed the guests and dignitaries who attended the ceremony and cookout. In attendance were World War II veterans Edmond Theriault, Bob Miele, Jerry Black and Don Rogers. As well as being introduced, they also performed the ceremonial cutting of the cake. Citations were given to American Legion Auxiliary President, Pam Whynot for the ongoing work of creating “ditty bags” for homeless veterans in the Portland Area. John Hill was recognized for his donations to Boys State. 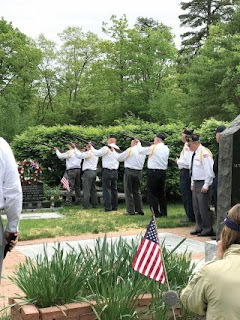 Senator Bill Diamond and Representatives Patrick Corey and Mark Bryant presented the American Legion Post with a legislative sentiment honoring the 80th anniversary of the post. 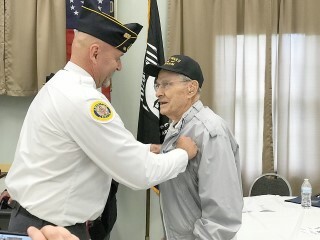 The highlight of the day was when WWII Army Veteran Bob Miele was invited up to receive WWII medals that he earned and never received. The post presented him with a ribbon bar containing the three medals and a shadow box containing the actual medals. He earned The American Campaign Medal, European-African-Mid East Medal and the World War Two Victory Medal. He had tears in his eyes as Colonel Wally Clarke pinned the ribbon bar on his jacket. Miele was a T/5 US Army Signal Corp 67th Airplane Warning Det. Member. He was given a standing ovation. “We got home and never received any medals or ribbons,” Miele said. He was talking to the veteran representative who comes to the veterans center regularly and then found he was eligible for the medals. “Dave Tanguay, who was instrumental, did a lot of work,” Miele said. “I was over in England as a radar operator, scanning for planes. We went to France a month after D-Day and landed on Omaha Beach,” he said. “It was quite an experience. I was probably in more danger in England than in France.” To get to England from America, he rode over on the Queen Mary with 10,000 other troops. He found himself in the kitchen of the ship peeling 100-pound bags of Maine potatoes. “We had to keep busy,” he added. In attendance at the ceremony, were eight of Miele’s nine great grandchildren, five of his seven grandchildren and two of his children; all there to help him celebrate the special honor. After lunch, the program moved to the Veterans Memorial Garden for a wreath placement at the Vietnam Memorial, a 21-rifle salute and “Taps”, played by Eagle Scout Dean Preston from Windham Troop 805. The day was one of shared history and a chance to honor those who have served for the freedoms of American citizens.